I‘ve seen this recipe around the Pinterest/Facebook/Blog world for a while, now and the first time I tried it, it was one of those moments when I bitterly complained that what I made didn’t look at ALL like the picture. Ever feel that way? I think the second time around, without a recipe, I just followed my nose and used the spices I like and let them roast much longer and I had SUCCESS! They turned out super crunchy, wonderfully spiced and a great little starter for our meal, which Olive claimed as the favorite part of her meal and kept saying, “Mes, hickpeas?” over and over and over. I really think she ate about a half cup. I wouldn’t recommend that to other moms, but that’s what happened and since they were part of the meal, I let it slide. But yeah, they eat like a snack and I would recommend this to anyone for a healthier option for a party snack, during a movie, etc. And you can have fun with whatever spice blend you want! Happy Monday and I hope everyone had a wonderful weekend! Preheat the oven to 375. Spread out the drained, rinsed chickpeas on paper towels and dry those suckers out WELL. Place the chickpeas on a rimmed baking sheet and add the olive oil. Mess them around with your hands till every last wee pea is coated in oil. Sprinkle the spice blend over the peas and roll them all around till they are all coated. 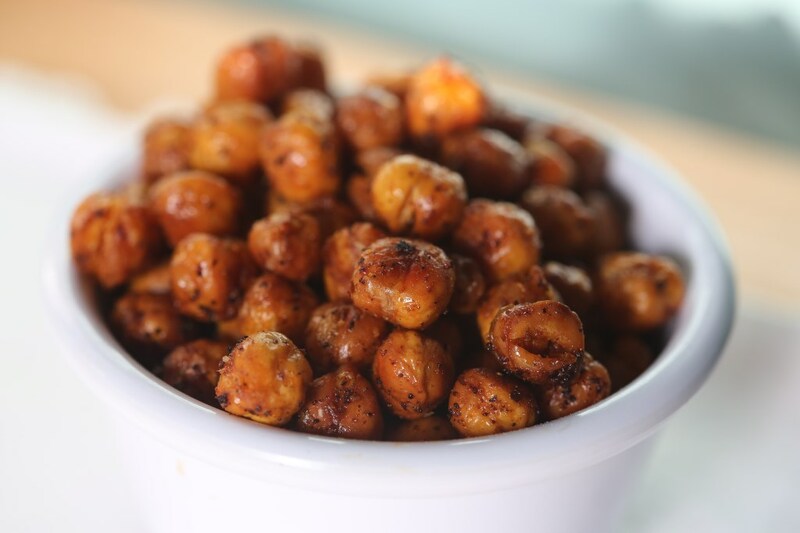 Place the chickpeas in the oven for 25-35 minutes until they are golden and when the pan is shaken, they sound hard and roll around easy. Let them cool for a bit before transferring them to a bowl, just because you don’t want to enthusiastically grab a handful of glowing-hot peas. Serve at the beginning of the meal or for a snack and enjoy!